The tablet form factor has been recognized as most suitable for many tasks on the field and on the job. Since many of those jobs are outdoors where it gets wet, hot and cold, and where devices get dropped or rattled. Now, there is a need for tablets that are tougher than what user can get from other consumer based tablet. 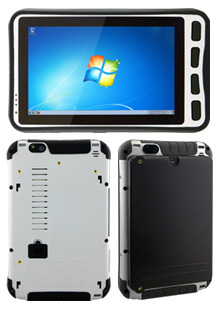 We, at Winmate come in with our M700D, 7-inch Windows Rugged Tablet. As far as the specification go, M700D measures 8.35 x 5.2 inches and with weigh less than 800 grm this tablet is still fairly light tablet. The housing is made of plastic body shell with rubber/elastomer bumpers and protection around the perimeter. With 500 Nits brightness, it looks sharp and ready for outdoor use. M700D is powered by 1.6 GHz Dual-Core Intel Atom N2600 Processor which is one of the best overall atom chips and plenty capable of running Windows 7 at a flawless pace. Standard RAM is 2GB, upgradeable to 4GB and mass storage comes in the form of SSD from 32-128 GB. A micro-SD card slot allows for extra storage and data transfer. In the battery side, the 16.8 watt-hour standard and the optional secondary 38.5 watt-hour battery is advisable and can support up to 8 hours. For Ruggedness, it can stands 4-ft drop, IP65 sealing for being dustproof and to handle low pressure water jets from all directions. The tablet can operate in a temperature range of -10 to 50 degrees Celcius, enough for most deployments.